Spacing: 6-8 ft. 8-10 ft. 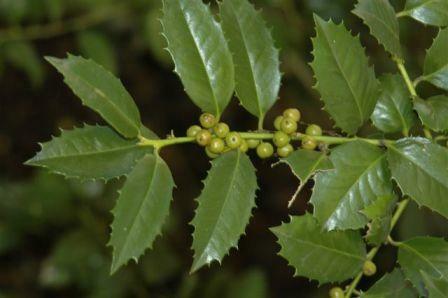 Habit: Mary Nell holly is a pyramidal evergreen shrub or small tree with very shiny dark green leaves which are 3-4 in long and have short soft spines along the margins. Mary Nell grows with a single trunk and unless it is kept pruned and produces an abundance of vivid red berries that seem to grow in a spiral around the stems. The showy berries persist on the bush for an extended period in the fall and winter. Culture: Grows best in full sun but can tolerate some shade. Should be pruned aggressively to encourage a dense framework of branches. Needs normal watering. Uses: Is valuable in an evergreen shrub border, as an informal hedge or as a specimen alone or in a small group. It can be pruned to tree form or to shrub form. Notes: Mary Nell holly is a relatively new cultivar and not yet heavily used but is quickly gaining popularity.